This crocheted poppy is part of a vintage Crocheted Flower and Grape Pot Holders Set, but I’ve included the motif pattern here in the flower section because it can easily serve as an applique for other items as well, such as bags and purses, pillows or placemats. NOTE: Please see the Crocheted Flower and Grape Pot Holders page for the foundation pattern, plus notes on the vintage threads used and possible modern substitutes. 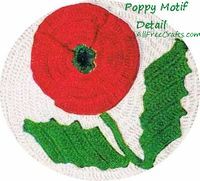 POPPY POTHOLDER- FLOWER: With Black embroidery cotton, ch 7, join to form a ring, ch 1, s c in ring, * ch 5, s c in same space, repeat from * 3 times, ch 5, join in 1 s c, cut thread. 2nd Round. Attach Green in any s c, ch 1, s c in same space. 5 sc in next loop, * s c in next s c, 5 sc in next loop, repeat from * all around, join in 1st s c, cut thread. 3rd Round. Attach Bright Red in any s c, working in back loop of sts only throughout, ch 3, d c in same space, 2 d c in each remaining s c, join in 3rd st of ch. 4th and 5th Rounds. Ch. 3, 2 d c in next d c, * 1 d c in next d c, 2 d c in next d c, repeat from * all around, join. 6th Round. Ch 4, 2 tr c in next d c, * 1 tr c in next d c, 2 tr c in next d c, repeat from * all around, join, cut thread. Make 4 pleats starting at the Green round and widening out to about 1/2 inch at the last round. Overlap all pleats in same direction to form petals. Tack with Redon underside of pleat leaving the last round free. Sew on top of potholder. LEAF: With Green, ch 18, d c in 4th st from hook, 1 dc in each remaining st of ch, ch 1, turn. 2nd Row. Sl st over the 1st 4 d c, ch 3, 1 d c in each of the next 12 sts, ch 6, turn. 3rd Row. D c in 4th st from hook, 1 dc in each of the next 2 sts of ch, 1 d c in each of the next 12 d c, ch 1 turn. Repeat the last 2 rows 3 times, cut thread. Work another leaf in same manner but repeat 2nd andd 3rd rows twice. 1 sc in each remaining st of ch, cut thread. Sew stem and leaves in position as illustrated.